The T4444 is specifically designed to hold and protect 4 strobe heads but can also accommodate other items. It will hold four Speedotron 102 heads, a variety of the Calumet Travelite systems or 4-5 White Lightnings, two Dyna-Lite M2000x packs and 4 heads plus accessories, 4 Elinchrom T heads or even a Hasselblad projector and accessories. Built with an internal, super lightweight structure of GE Lexan then covered with shock absorbent cell foam with padded touch fastener-compatible tricot. This inner shell, guaranteed for a lifetime, is resilient and remarkably protective. Zippers are self-healing nylon coil integrated with the fabric for strength. The exterior is ballistic nylon. 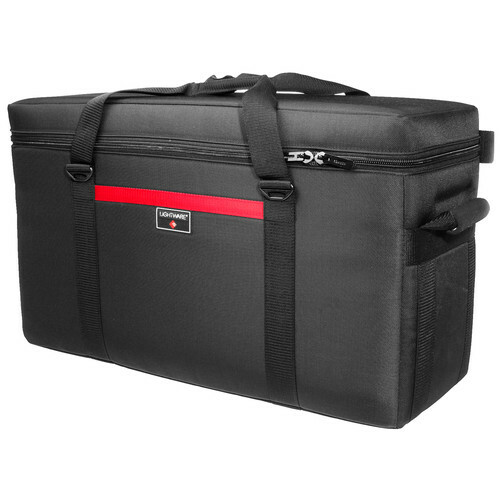 Box Dimensions (LxWxH) 32.3 x 21.5 x 13.3"
T4444 Four Strobe Head Lighting Case is rated 5.0 out of 5 by 4. Rated 5 out of 5 by Aperitive from One. Great. Case. I picked this case up when I needed a sturdy unit to transport my lights. Being a wedding photographer, appearance and functionality go hand in hand. With some creative spacing, I was able to fit a Zeus Power-Pack, two Alien Bee 1600's, a Zeus 2500, a Zeus Ring Master ring flash, three 7 cone reflectors, three power cords (plus the two permanent mounted cords on the Zeus 2500 and ring flash) and I still had room for a plastic Plano bin box that holds my radio triggers and remote cords. Satisfied? Very much so. Its been six months and nothing has happened to the bag or the contents therein. No rips, no tears, no popped seams. The exterior doesn't gather or keep dirt. Rated 5 out of 5 by SUJIT SARKAR from Excellent Case I have 4 Ligtware cases, 3 for Power packs and one Multi format for my cameras . They really are the best when it comes to protecting your expensive equipments from shock and rough handling.The cases look elegant and professional too. Rated 5 out of 5 by Traderjoe from Best of Class Lightware is the Mercedes of protection for professional photography gear. Expensive - yes, but American made in the highest quality. Company backs up its products, too. Have owned several pieces and never regretted a purchase. Rated 5 out of 5 by Richard Romero from I will recomend it to a friend! I bought the new Speedotron power pack 1005 with two 202VF heads and was looking for a compact and sturdy case to travel to Brasil and take the beat at the airports from the cargo crew and this case will protect my equipment. Yes this case can hold up to 4 Bowens Gemini 500 monolights.